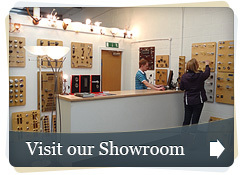 Our extensive showroom is close to Chester and is simple to find from the M6 and M56 motorways. We are open weekdays 8am - 5pm and Saturdays 10am - 1pm. Closed Sundays and bank holidays. Viewings on bank holidays can be arranged by appointment between 9am and midday. (If you are coming to see something specific it is a good idea to call and ask if we have it on display before you travel. We can only display so much!). . Cheshire Hardware Ltd, Unit 1 Hartford Business Centre, Chester Road, Hartford, Cheshire, CW8 2AB. We welcome all your enquiries, from product and technical queries to ironmongery scheduling enquiries. Our G.A.I. qualified staff are here to help in any way they can. You can contact us by email using the form below. We will respond to your enquiry as soon as we can. If you prefer to speak to us directly, please do not hesitate to call us on 01606 888520. Sometimes a picture/drawing speaks a thousand words. You can fax your enquiry to us on 01606 888358 or e mail - please include your contact details. Privacy note: We do not use the detail you enter on this page for any other reason than to handle your enquiry with us.